How To Participate In Geo TV Pakistan Idol 2013 Auditions? Geo TV Networks has recently launched a new singing reality show 'PakistanIdol - Jo Hai Awaz Dil Ki' and the show will be aired on the channel soon. 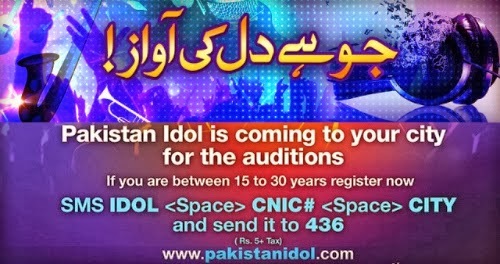 Theauditions of the Pakistan Idol is already started in various cities of Pakistan.The details for participation in Pakistan Idol 2013 Auditions are mentioned after the jump. The auditions in Islamabad were held on 9th September, 2013 and the team will visit Lahore, Karachi, Peshawar, Quetta and other major cities of Pakistan soon. Get yourself registered for the auditions before it's too late. The registration method is written below. How To Participate In Pakistan Idol 2013? IDOL <space> CNIC # <space> City. Send it to 436. After sending the SMS on 436, you will get registered to Pakistan Idol and will receive a pin code through SMS. Then, you will be informed about auditionsdate and venue on your phone number. Note: In auditions, the contestant has to bring his/her CNIC and parents' CNIC as well for verification purpose. For More Information and Details, Please Visit PakistanIdol.com. Are you going to participate in Pakistan Idol? Let us know in the comments below. Blogiapa - Learn To Do More! : How To Participate In Geo TV Pakistan Idol 2013 Auditions?